Random Thoughts of Gil Camporazo: On Environment: Stop Finger Pointing. Do Your Share! On Environment: Stop Finger Pointing. Do Your Share! 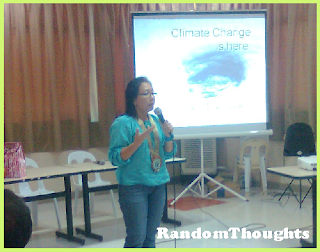 Unavoidably it is very alarming the effect of climate change to people's lives or anything that exists as pointed out in the environment forum held recently at La Carlota City, attended by the representatives of government agencies, the education sector,and others. As a result of research paper writing skill by some environmentalists or scholars, reliable and dependable facts tell the real situation of the country and even the world. The world is getting warmer, hotter, and dangerous for the people to live for climate change couldn't be stopped. 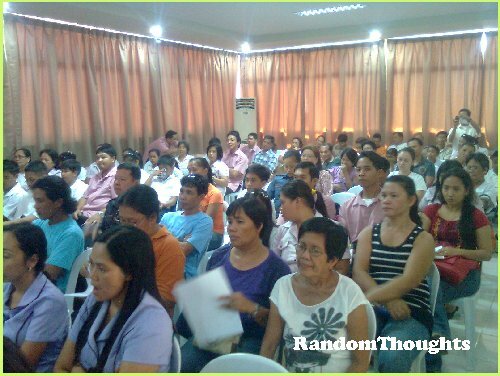 "50% of the Filipinos depend in agriculture. 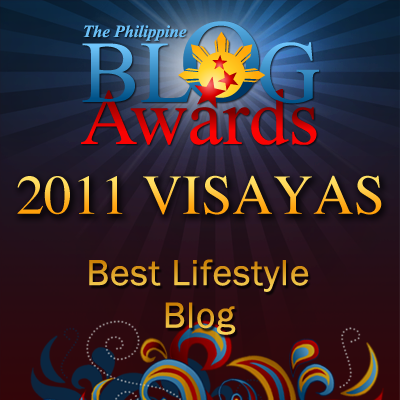 50% of the Filipinos depend on seafood as their primary source of protein," the research showed. Ms. Olive H. Seruelo, Provincial Environment Management Office (PEMO) information officer comprehensively deliberated all these things on her lecture on climate change. "Climate change is here," she said and presented "life-threatening" impacts of climate change to major areas of people's existence. She also discussed the effect of green house gases (GHG) which contributed by the following factors such as Agriculture - 32%, Industry - 10%, Waste - 9%, and Energy - 49%. With supporting facts and figures, she enumerated the potential climate change impact which affects the temperature, precipitation, and sea level rise. Health - weather-related mortality, infectious diseases, air quality, respiratory illness. Changes in climate should not be taken for granted. They are happening faster than before. They have begun (1750) and will continue for the foreseeable future. These have been emphasized seriously. We should do away with such common expression such as "business as usual" when in fact we're suffering these natural phenomenon, for it is not an option. These realities may be "mitigated" unless action is taken ow. Otherwise, the standard of living will suffer far worse, as pointed out in the presentation. She urged everyone to "believe and practice" for it requires concerted efforts. She said, "We must plan and work together." "Avoid the unthinkable. Adapt to the unavoidable." She ended up her informative, factual lecture via powerpoint presentation by quoting William Arthur Ward, "God gave you a gift of 86,400 seconds today. Have you used one to say 'Thank You'?" La Carlota councilor Jacob Liansing, chair on Environment Committee reacted to the issue raised by some teachers on the rampant use of plastic as wrapper, bag, receptable for anything bought in the market. He assured that this problem could be remedied for the city council will pass an ordinance to this effect and a public hearing will be conducted to iron issues and concern for the immediate passing of this ordinance. Before the forum finally ended, I shared my concern and a solution to the noncompliance of Clean Air Act, Clean Water Act, and Solid Waste Management Act. "As of this moment, how many are we here present?" I called everyone's attention, "Our number is enough to initially implement this environment measure to be effective. It will practically start from us, from our own family. It's by example that we' could lead others to do the same. Let's stop finger pointing. Let's do our share! So be it!" I have been very concerned about the global warming and I highly practice the nature-friendly acts. Indeed, it should start first from ourselves. The parents have also a big part to educate their children at home. Great share you have here Sir Gil. Good thing there's an event like this. Environmental issues are real issues to be addressed not only by the government but also by each and every one of us. Like you said,we should all be doing our share. I agree too. The change should come from within, it should start from us and we should teach our kids and the whole family so in return their friends can learn from them too. It's a domino effect and in time we are helping the community, our town and our country. Everyone should do his share. I hope the industrial companies will cooperate as well, not just the households. The weather now is so unpredictable. It can rain in an hour then shine another and rain again and so on. This is an eye opener as the worst is yet to come if we don't take care of our environment. You are so right, the only problem for some people, they are always talking and they don't even cooperate. everything has to start from something. and caring for our environment must start from those who use it which is US. people should really do their part.thank you sir for sharing this post. Thanks for raising awareness, sir Gil. This is very beneficial to one and all. I agree stop pointing finger when it comes to environment. Rather than use those fingers to point. Use it to lift a seed and plant a Tree. yeah its all true! we need not point fingers to anyone who is possible culprit here because we all are. What's important now is to start our own share in preserving our environment. I watched Harrison Ford say something about climate change. He said that wahtever we do in our part of the world has a direct effect on their side and the rest of the world. So when we decide to clean up our act, we are, in effect, doing something good for the rest of the world. and same thing goes when it's the other way around. the mood swings of our weather is really alarming. so, even if in small things, i do things that will make our mother earth happy. I agree, this should be the first step. Stop finger pointing! We point the blame to other people that we oftentimes forget do our part. This must change. Everybody has to do their share of concern to the environment, Start at home with the family member. I go for this. As a member of Environmental Group here in our City this is really the BIG PROBLEM we have now. STOP FINGER POINTING whose to blame and who are the people assigned to this task. We must take action NOW! Everyone of us is affected. It will start with our self. I'm proud to say that private universities are getting into this sustainable development effort as well. I was the Campus Sustainability Officer of the first such office at DLSU last year and we have a lot of plans (some finished; rest are on-going) of making a difference in our immediate vicinity first. Too often, sustainability efforts become too lofty - the street is cleaned before our own yards, for example. This is so true, sir! We all have our roles to play in taking care of our one and only home. I do agree. In our times today, finger pointing to whose fault it is, we have to remember that everything happens not just for others but start in ourselves. We must do our part in our own little ways to help mother earth. 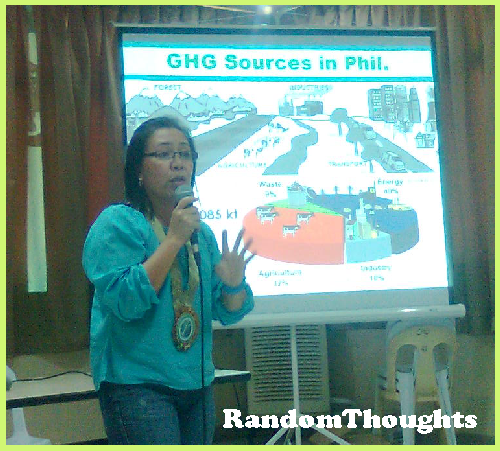 I think such programs and seminars helps in terms of educating the people about the importance of doing their part in helping mother nature. Climate has changed a lot and it will surely affect us all. we should walk our talk otherwise we will all suffer. You are right, just do one's share and stop pointing fingers. Time is running! Small things will become big if many people doing these small things! We can do more to save our environment. It's not too late!